In the 450th anniversary of Shakespeare's birth, the Royal Shakespeare Company are staging some of the Bard's greatest plays. In the 450th anniversary of Shakespeare's birth, the Royal Shakespeare Company are staging some of the Bard's greatest plays - and you can see them on screen at the Electric Picture House in Wotton-under-Edge, live via satellite from Shakespeare's birthplace, Stratford upon Avon. Following his production of Richard II in 2013, RSC Artistic Director Gregory Doran continues his exploration of Shakespeare’s history plays with Henry IV Parts I and II, an epic, comic and thrilling vision of a nation in turmoil. Henry IV part I is showing on Wednesday 14 May at 7pm. The play sees the King preparing for war, his crown under threat from enemies both foreign and domestic. Having deposed the previous king, he is only too aware of the tenuousness of his position, and of the price to be paid if he falters. As his father prepares to defend his crown, Prince Hal is languishing in the taverns and brothels of London, revelling in the company of his friend, the notorious Sir John Falstaff. With the onset of the war, Hal and Falstaff are thrust into the brutal reality of the battlefield, where Hal must confront his responsibilities to family and throne. 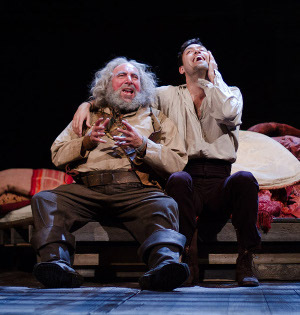 RSC Associate Artist Antony Sher returns to the Company to play the infamous comic knight Falstaff. He is joined by Jasper Britton as Henry IV and Alex Hassell as Prince Hal. The story continues in Henry IV Part II, showing on Wednesday 18 June at 7pm. Other theatre events in the Wotton cinema include encore screenings of the National Theatre's The Curious Incident of the Dog in the Night-Time, based on the bestseller by Mark Haddon. The first scheduled screening of the play, on Thursday 22 May, has now sold out; a further screening has been added on Saturday 24 May at 7.30pm. The event has a 15 certificate. Tickets for all these screenings cost £10 (£9 concessions) and can be booked in advance through the cinema's website, www.wottoncinema.com. Advance tickets can also be purchased at the cinema during opening hours, or by calling 01453 844601.